First, it might prove helpful to hear an authoritative definition of the musical genre known as ragtime, so here is what the Encyclopedia Britannica says about the subject: Ragtime is a "propulsively syncopated musical style, one forerunner of jazz and the predominant style of American popular music from about 1899 to 1917. Ragtime evolved in the playing of honky-tonk pianists along the Mississippi and Missouri rivers in the last decades of the 19th century. It was influenced by minstrel-show songs, blacks' banjo styles, and syncopated (off-beat) dance rhythms of the cakewalk, and also elements of European music. Ragtime found its characteristic expression in formally structured piano compositions. The regularly accented left-hand beat, in 4/4 or 2/4 time, was opposed in the right hand by a fast, bouncingly syncopated melody that gave the music its powerful forward impetus. "Scott Joplin, called 'King of Ragtime,' published the most successful of the early rags, 'The Maple Leaf Rag,' in 1899. Joplin, who considered ragtime a permanent and serious branch of classical music, composed hundreds of short pieces, a set of études, and operas in the style. Other important performers were, in St. Louis, Louis Chauvin and Thomas M. Turpin (father of St. Louis ragtime) and, in New Orleans, Tony Jackson." On the present recording, pianist Michael Adcock plays a wide-ranging assortment of ragtime tunes, from Scott Joplin to William Bolcom and John Musto. 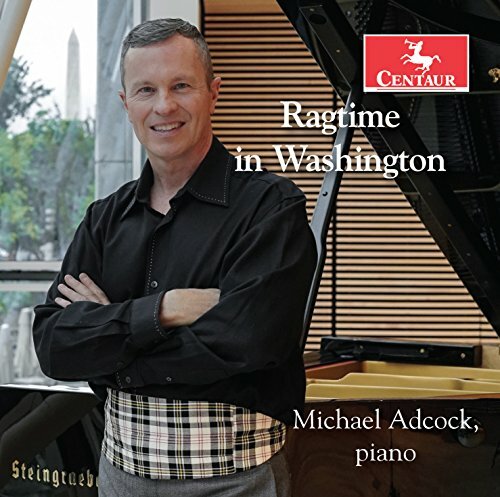 Mr. Adcock's Web site describes him as follows: "Hailed for his prodigious technique and praised by the Washington Post for an 'unusually fresh and arresting approach to the piano,' pianist Michael Adcock has cultivated a versatile career as soloist, chamber musician and pre-concert lecturer. Recipient of the 1998 Lili Boulanger Memorial Award, Mr. Adcock was also a prizewinner in the 1996 Washington International Competition and the Kosciuszko Foundation Chopin Competitions in Chicago and New York. Mr. Adcock gave his Carnegie Weill Recital Hall debut in December of 1998. Mr. Adcock earned Master's, Artist Diploma and Doctoral degrees from Peabody Conservatory, where he studied with Leon Fleisher and Ellen Mack, and was adjunct faculty in theory and chamber music. Mr. Adcock took his Bachelor's degree from Oberlin College-Conservatory and attended secondary school at North Carolina School of the Arts." Because Scott Joplin considered ragtime a form of classical music and because Mr. Adcock is primarily a classical pianist, it is no wonder that Adcock takes a kind of classical approach to the music. His playing is more subtle, more reserved, more intimate than most other performers I've heard in this genre. It's quite beautiful, but it is also a bit different and, at the same time, refreshing. Interestingly, the popularity of ragtime has ebbed and flowed. As the encyclopedia mentioned, its height of favor was from about 1899 to about 1917, the end of the First World War. Then it got pretty much shoved aside by various other kinds of jazz. However, a revival occurred in 1973, thanks to the film The Sting, with Marvin Hamlisch arranging and playing Joplin's music. Hamlisch's single from the soundtrack, "The Entertainer," even became a top-ten hit. The irony is that the movie's time setting was 1936, well after the heyday of ragtime; but it didn't matter. For a while, ragtime was back in the public eye. And then, well, the music sort of faded into obscurity again, so it's good to have Mr. Adcock's new album. Favorites on the disc? Of course. Since "Bethena" has been well liked for over a century, Adcock leads with it. He presents it in an attractively gentle manner, bringing out the more-plaintive, lyrical waltz characteristics of the music. Likewise is Adcock's handling of the crowd-pleasing "The Easy Winners" takes on a sweeter quality than usual. Then he follows with the more upbeat "Red Pepper Rag," which like Gershwin's "Rialto Ripples" gives the pianist room to rock. Still, as I say, Adcock's classical leanings may be more than a bit disconcerting to people more attuned to traditionally hell-bent interpretations. For the rest of us, the playing is superb and the renditions charming and affectionate. That's doubly the case for Adcock's reading of Thomas Benjamin's delightful lampoon of Arnold Schonberg via Scott Joplin in "That Old Second-Viennese-School Rag." So, even the modern things from Benjamin, Bolcom, Albright, and Musto come off well. Joplin's "Solace" brings the program to an appropriately tranquil and comforting end. It's all highly entertaining (and not a little enlightening), which is the whole point of music. Producer Michael Adcock and engineer David Shoemaker recorded the music at Calvary United Methodist Church, Frederick, Maryland in May 2017. The results are quite good. First, however, a digression. Many years ago (1982 to be exact), the late Dave Wilson of Wilson Audio had just recorded a pair of albums he called "Ragtime Razzmatazz" with pianist Mark P. Wetch. Dave invited me to listen to the actual piano in the actual location he recorded the albums and then to hear the music in his living room through his big WAMM (Wilson Audio Modular Monitor) super speakers. With my eyes closed, the sound of the real thing and the sound of the recording were pretty much alike, especially as Dave had recorded the piano very close, and when we were listening to the real thing, we were sitting very close. Now, I mention this because there are similarities between Dave's recording and this newer one from Centaur. Both are fairly close up, and both capture the sound of the instrument in a similar fashion. Dave's recording, though, used a huge, Kroeger "hard-tuned" honky-tonk-sounding upright piano. Mr. Adcock plays a fully restored New York Steinway D from PianoCraft. Big difference. So, yes, Adcock's piano has less obvious ring and reverberation, a softer, mellower, and more precise sound, nicely captured by the sound engineer in a modestly reverberant setting, with a mild fuzz or buzz around the strings. Dave went for an authentic saloon sound; Centaur projects a more classical concert-hall presentation. Both are worthy of the music, which works so well in both mediums.